I know–why predict 2015 outcomes. That’s last year, right? Right. But the Census Bureau publishes estimates of household income and poverty results with a lag. This year, their results for 2015 will come out on Sept. 13. I’ll write them up that day, as is my wont, but for reasons I can’t explain, I always like to try to forecast them. My track record isn’t great. Last year, I was fairly confident that poverty fell in 2014, but it held at 14.8%, meaning that’s the share of the population with 2014 incomes below the poverty thresholds (plural because the thresholds change by family size). However, the 2014 results were somewhat ambiguous because Census did some redesigning of their income questions. There may have been some comparability issues with the samples used to compute the changes in poverty and income. –poverty fell half-a-percentage point, from 14.8% to 14.3%. –real median HH income rose 1%. The poverty change would be statistically significant; the income change would not be. For a variety of reasons, we could see more of an upside than a downside surprise–i.e., a greater fall in poverty and rise in income than I’m predicting. For one, I think the survey changes may have missed the decline in 2014, so there’s some pent-up juice there. For another, inflation was almost 0 last year, and that turns out to matter in these data. The poverty thresholds are adjusted by the rate of inflation. So if inflation is very low, the thresholds hardly change at all. Meanwhile, people’s nominal incomes tend to rise year-over-year, especially when the job market’s tightening, as it was in 2015. That should push up the real HH median income and bring down the poverty rate. My model runs off of mostly inflation and labor market variables, and since I have these outcomes for 2015, I can make the prediction. So, based on very low inflation and the growth in jobs and real wages last year, I think the results will be a marked improvement over last year’s. That doesn’t imply happy days, ftr. After six years of recovery, both variables will still have not returned to their pre-recession levels back in 2007. The politics of this are always interesting in an election year. The R’s just finished a convention that painted what I’d bet is the most negative picture of America ever to come out of party’s nomination process. If I’m in the ballpark, the results may cause some dissonance, though that assumes an acceptance of data/facts–a strong assumption, indeed. Share the post "Poverty and income predictions for 2015"
4 comments in reply to "Poverty and income predictions for 2015"
Hi Jared. That’s about all I have to say. I’m just saying hi, I guess. When have wages been as stagnant or declining in the postwar era (past 70 years) for this long (now 15 years and counting)? How about never. If full employment is the answer, why was unemployment higher in the late 1990s while incomes were climbing? I don’t really see that, it’s below 4.5% only two years, and well above that while income climbed throughout the decade. I can’t tease out other factors like immigration, but interestingly the numbers are significant in certain sectors across skill levels, (construction and I.T. ), small in relation to total workforce (150 million), or job churn (a surprisingly humongous 60 million/year opened and filled, labor turnover the BLS calls it), but large if just considering total new jobs, being that just 1.5 million a year matches population growth of labor force with .6 participation rate. You may blame the current mess on Republicans, but the public has voted alternating parties into the White House every 8 years since Roosevelt, the only variance being Carter with only 4 followed by Reagan-Bush granted 12. Not a good sign. *Note: Is there a demographic effect from retired boomers? Yes. How big? Presumably retirees make the highest wages at the end of their career, just before retiring. Since everyone moves up, it’s not the same as their being replaced by a new worker, but their replacement might not earn as much, new workers in poor job market get lower starting salaries. 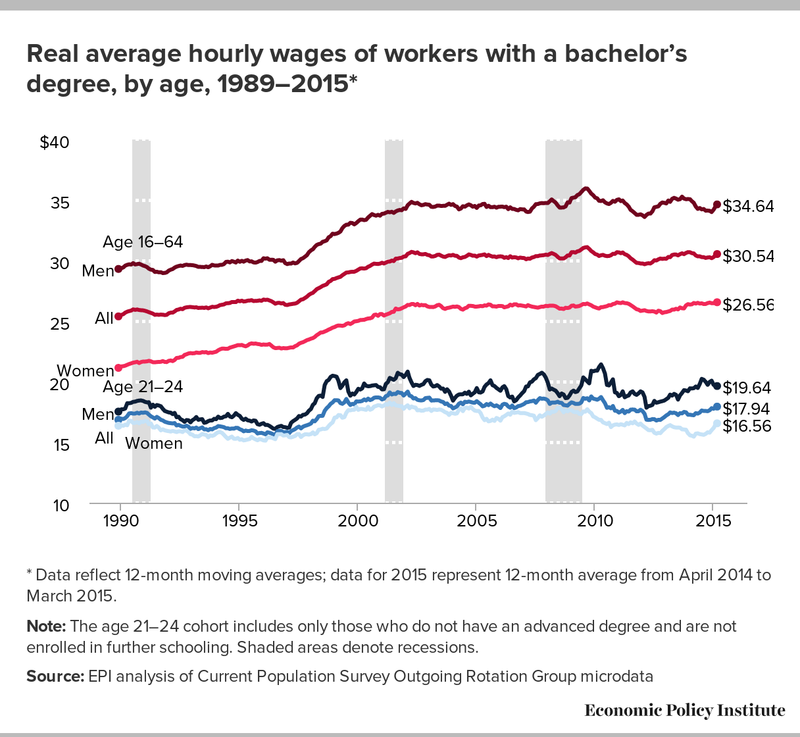 Younger average age means lower average salaries. What is the average age of the workforce tracked over time? Also wanted to mention the household size and ratio of size to working members that the wiki chart always shows as a key. The intuition says free (quality) child care is part of the problem, including previously cited gaps in universal public school (for ages 1-4, for the hours of 3:00 pm to 5:00 pm, and the months of July and August) HIgher income parents who work fill these gaps, lower income parents often can not.